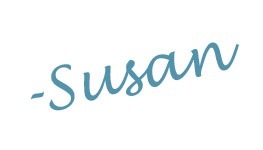 A Bedroom Update Part 1 – Uniquely Yours… or Mine! This post is part 1 of a series of posts following the update to our youngest daughter’s “new” bedroom. 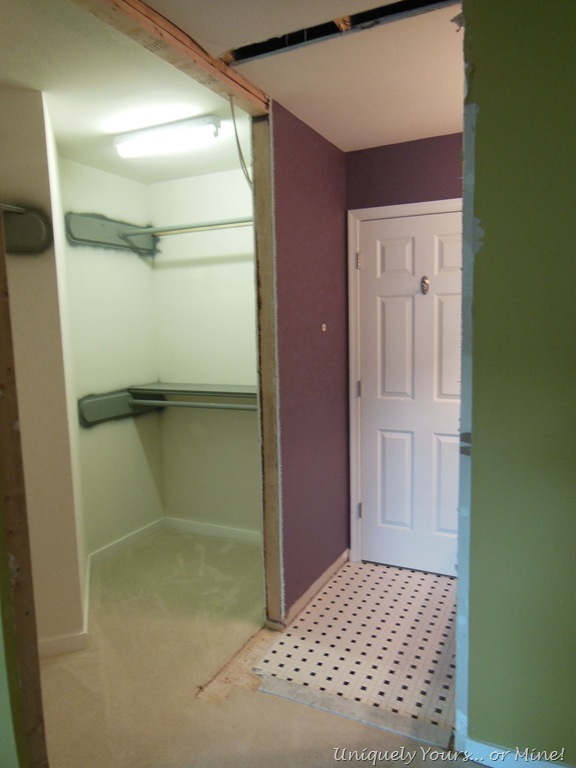 Here is a view of the area in question… there is this unused space on the right and the vanity area (part of a Jack & Jill bathroom setup) straight ahead and a walk in closet to the left. 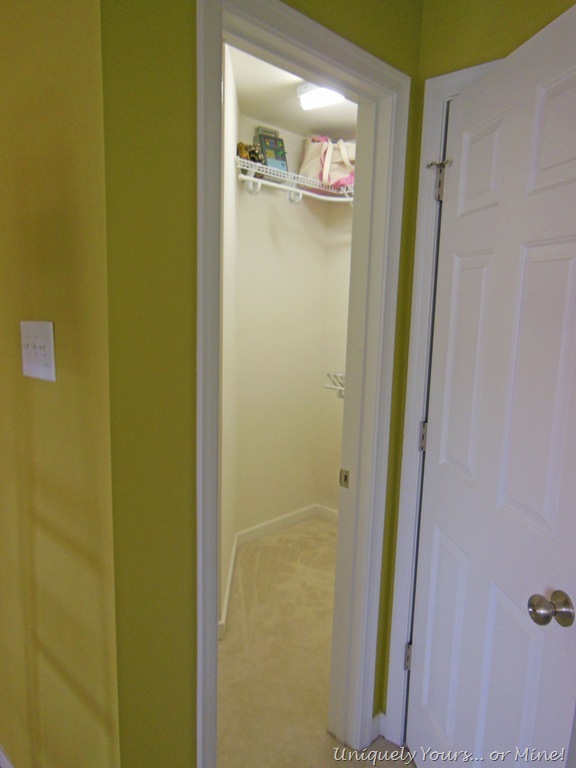 As you can see the bathroom door and the closet door take up most of this area… had we custom built this house I would have used pocket doors here for sure! 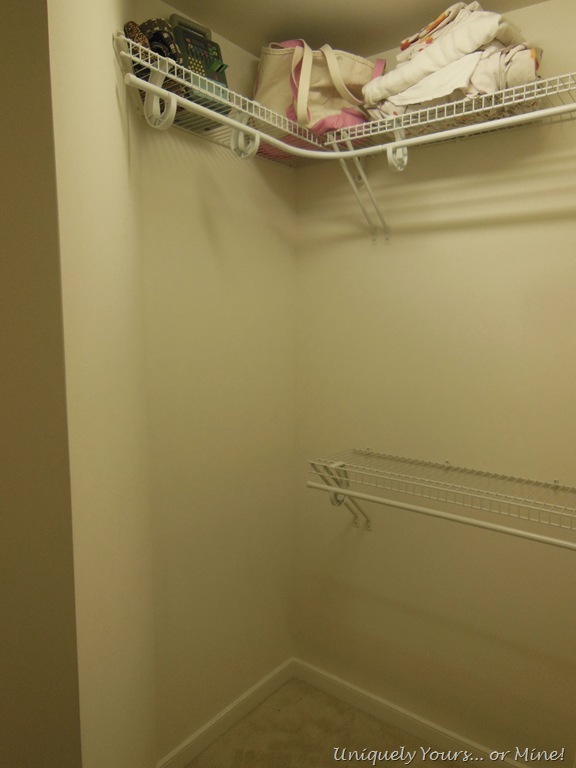 There is also this weird jut out corner in the closet created by the backside of the hall linen closet… I think this area could have been planned better! We removed the wire shelving (sorry, but I really can’t stand wire shelving), modified the setup of the shelves and added wood shelves and rods. Here is the left side of the jut out where the area is setup for long hanging items. I decided to paint the shelves and poles grey using a custom 50/50 mix of ASCP Graphite & Old White. 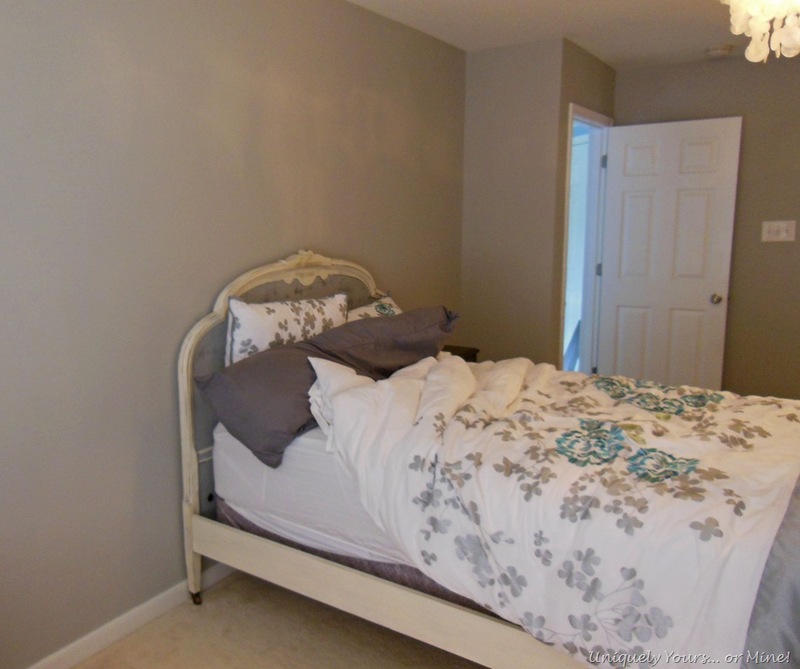 I prefer the look of the dark grey color against the soft grey walls better than if I had just painted them white. The wood supports jut out past the rods for a reason… I’ll come back to that! 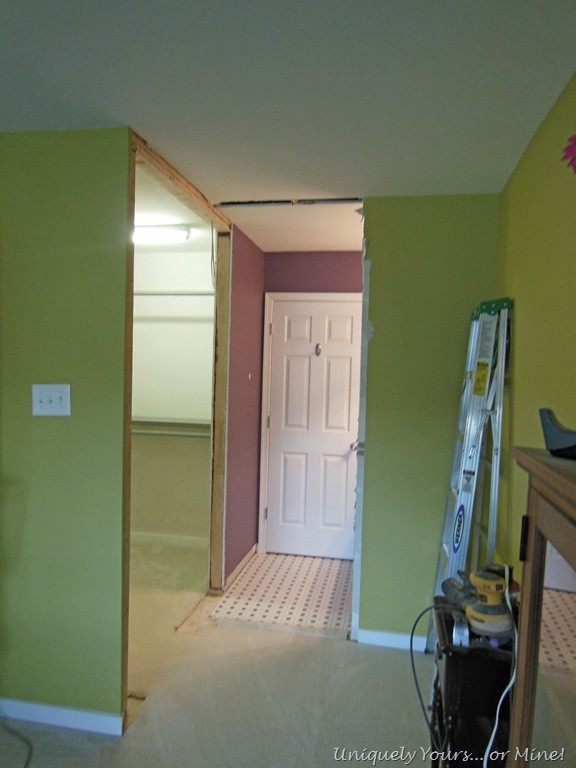 This was the “fun” part… removing the walls to open this space up! We are going to make this whole area a dressing area by removing some of the walls, both doors, carpet and tile! Pretty sure Hubby should be wearing shoes… totally not safe! 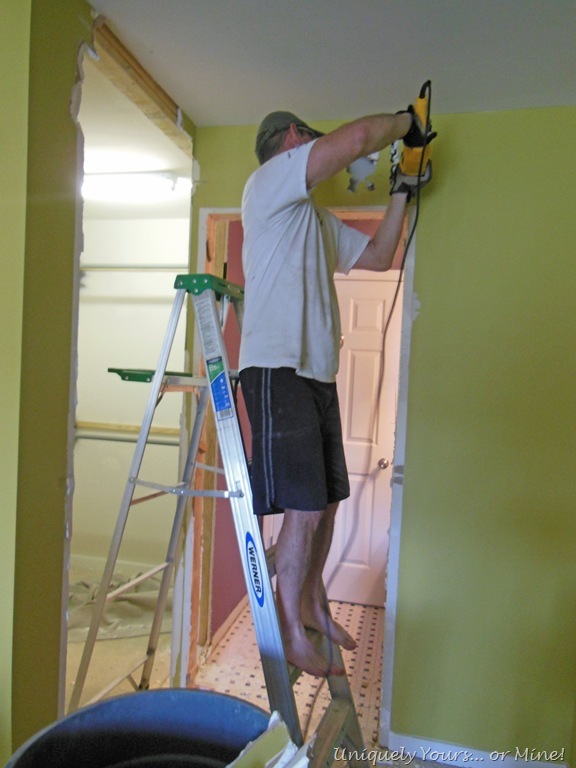 Here he is cutting the wall with the reciprocating saw… that tool made quick work of those walls! Here is the same area now opened up! It truly is such a great space already! We will be doing some sheetrock repair, but also trimming out the openings with molding as well. 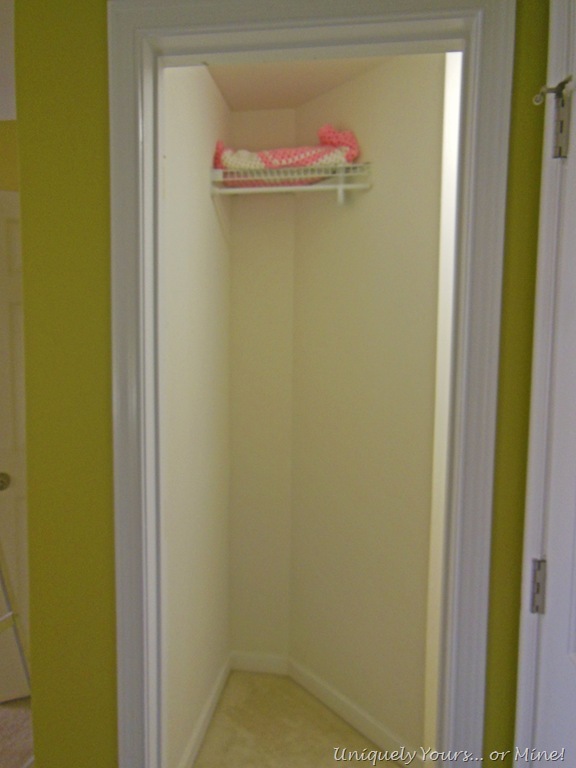 Looking into the closet area… see the jut out I was talking about?! We also got the walls painted! We had Va. Paint color match Pavilion Gray by Farrow & Ball in Benjamin Moore Regal Select Matte finish… let me tell you this paint is AWESOME! 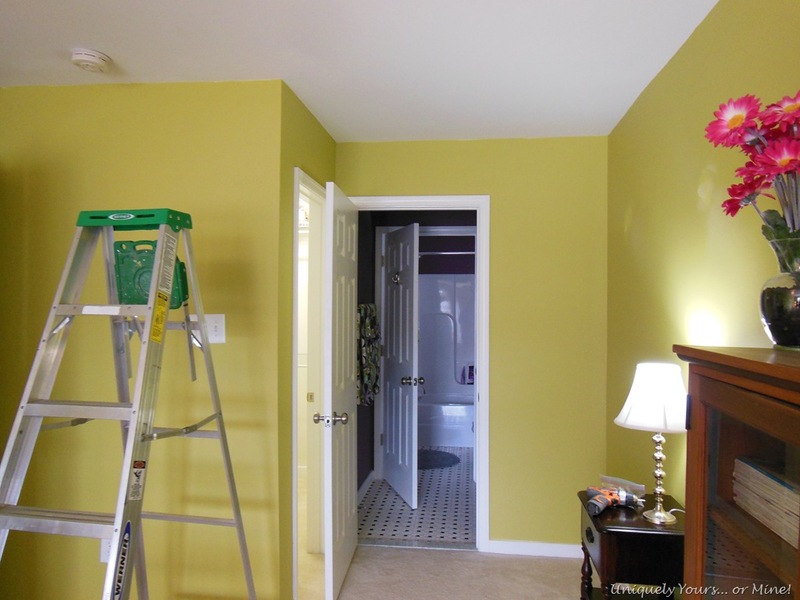 It covered that Wasabi Green in 1 coat!!! It went on super smooth and is just gorgeous! 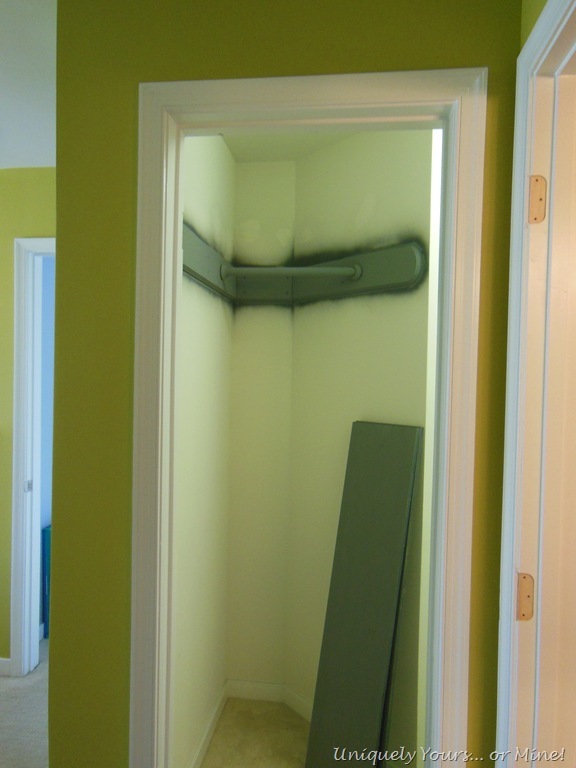 When we painted the inside of the closet, which was still painted the builder’s white, it took 2 coats… the wallboard just absorbed the paint! 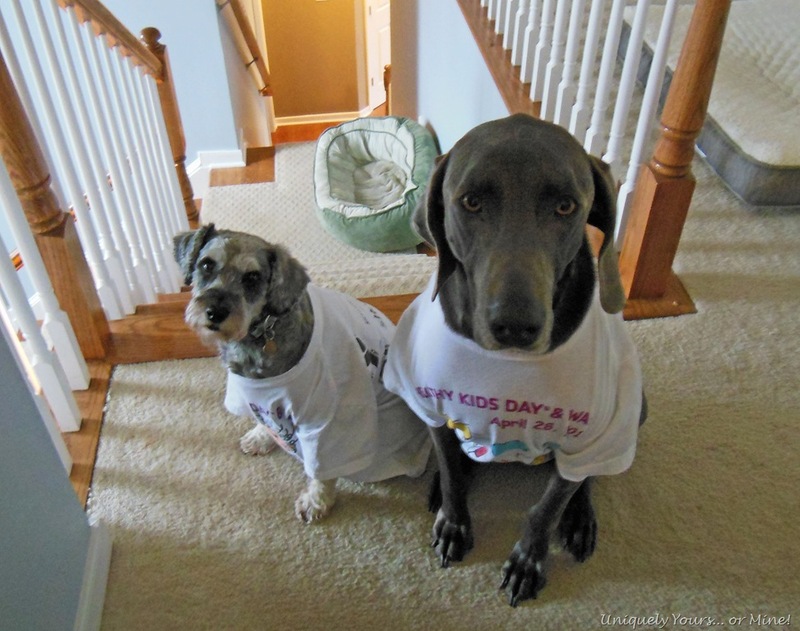 She also put some “work shirts” on the dogs… see how happy they were about that ! Not to mention they were not at all helpful! We are hoping to get done before Thanksgiving… we are only working on it on the weekends so we will see how that timeline goes! Previous Post: I Believe In the Great Pumpkin Do You? It is coming along nicely. Can’t wait to see it finished. The dogs don’t look thrilled. Looking like a lot of fun. 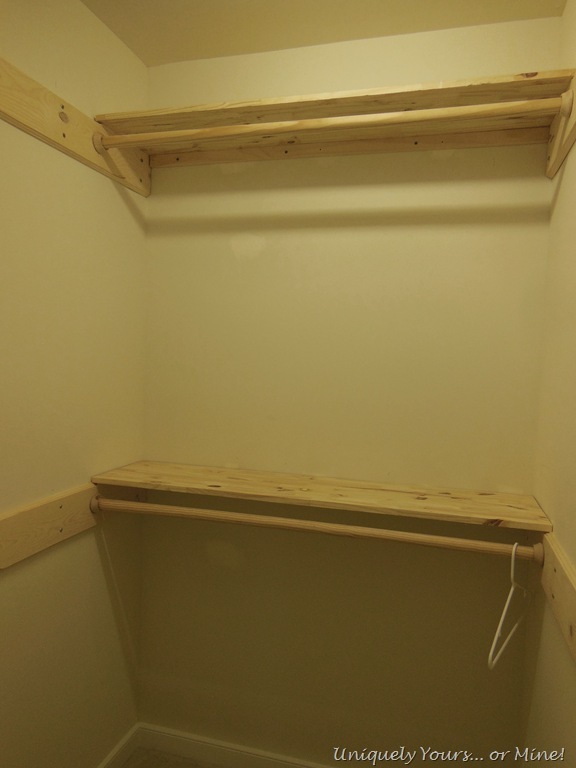 Pingback: Awkward Closet Turned Dressing Room! « Uniquely Yours… or Mine!